The Bone Charmer, Breeana Shields’ exciting new fantasy novel, comes out this May and we’ve got your first look at its beautiful cover and first chapter! In the world of The Bone Charmer, bones are the ultimate source of power. They can tell the future, shed light on the past, and dig up even the most elusive secrets in the present. And those whose fate it is to read the bones are Bone Charmers. But what happens to those who are chosen to be Bone Charmers who don’t want to be? And what happens when someone breaks the bones? 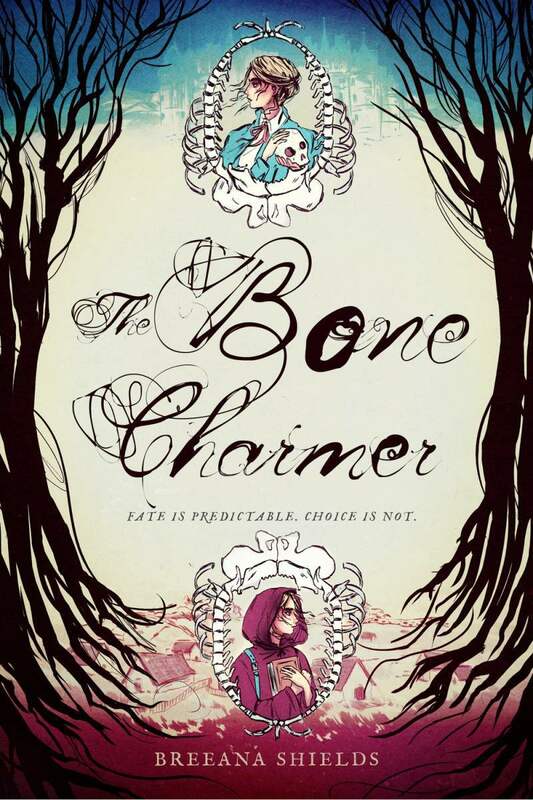 The Bone Charmer tells the story of Saskia, a seventeen-year-old who’s fated to become the last thing she ever wanted to be. But when Saskia tries to fight her fate, she splits her future and puts herself in more danger than she could’ve ever imagined. This YA fantasy is one you definitely don’t want to miss. Tomorrow my future will be decided by my dead gran’s finger bones. It’s how my whole life has been determined—with bones and blood and snapping flames. When I was five days old, my mother dangled me over a stone basin that was heavy with the shoulder blades of an ox and pierced my heel with a sewing needle. I’m not sure how many drops of blood splashed into the basin. One? Two? Ten? It doesn’t matter. It was enough blood to infuse the bones with my essence. Enough blood to tell my mother anything she wanted to know about the next few years of my life. It’s always been a prickly thing between us, her insight and my ignorance. And the other way around, too. The bones can’t show her my heart. I creep down the stairs toward the sharp scent of a sure sign my mother is consulting the bones about one thing or another. It’s almost impossible to sneak up on her, but I can’t resist trying. Maybe if I know what she’s up to, I’ll have some hint about what the morning will bring. The deep voice that resonates from below surprises me so much that I nearly forget to avoid the creaky fifth step. My mother isn’t alone—one of the townsfolk must have arrived for a last-minute reading before the kenning tomorrow. I sag against the wall, disappointed. I don’t care about knowing any future except my own. Yet the sound of bone scraping against stone propels my feet forward. When I reach the bottom of the staircase, I peek around the corner. My mother sits in the center of the room across from one of Midwood’s most prominent farmers, Mikkel Hemming. A stone basin rests on the floor between them, filled with a handful of animal bones that, from the looks of them, are probably cheaply prepared and not especially powerful. A casual reading then. Nothing like the ceremony and solemnity that always permeates the kenning. My mother isn’t even wearing her Bone Charmer robes. “It’s no trouble at all,” my mother says. She pricks Mikkel’s index finger with a needle and squeezes a few drops of blood onto the bones. Then she uses a bit of flint and a stone to light a small fire in the basin. The room tilts and I squeeze my eyes shut. Minutes seem to pass and then, beneath my closed eyelids, I see Mikkel at the door, his hat clutched in one hand. I startle as I hear his voice in my head, thanking my mother for her time. My eyes fly open, but to my horror my mother is still at the beginning of the reading—tipping the bones onto the rug in front of her. This hasn’t happened in years—this unsteadiness around the bones, as if the magic is like a dog on a lead, determined to reach me whether I want it or not. Dread sits in my stomach like soured milk. An image of sharp black tattoos shaped like arrowheads rises in the back of my mind and I shove it away. Gran said once that in families with long lines of bone magic—families like ours—power is like a fire that burns hotter with each new generation. She meant it to be encouraging, and she had pride in her eyes when she said it, but by then I already knew the truth—the stronger the blaze, the harder it is to control. And the faster it destroys. Bone magic would be dangerous in my hands. I press my knuckles to my mouth. Mikkel is still sitting silently across from my mother. Picturing anything else was only the result of an overactive imagination. Still, I don’t want to be matched as a Bone Charmer tomorrow. Surely, there’s a path more appealing for me than the constant risk of hurting someone I’m supposed to help. I push my back against the wall as she walks him to the door and closes it softly behind him. I edge slowly up the staircase. She shakes her head and walks away. I follow her to the kitchen, where she picks up an apple from the bowl on the table and slices off a section with a knife. She pops a piece of the fruit into her mouth. “What’s best for me is to have some measure of happiness,” I tell her. Gran had First Sight—the ability to see the past. My mother has Third Sight—the ability to see the future—but I wish she had one of the other two Sights instead. Then I could get my kenning from a different Bone Charmer, one who wasn’t concerned with preserving the family legacy. I open my mouth to tell her that she’s misread my concerns entirely. I’m not worried about having too little power. I already know that there’s more heartache in having too much. But if I go down this road with her, she’ll ask for explanations that I’m not willing to give. Knowing what I want my life to look like should be enough for her. Anger flares in my chest at her cavalier dismissal of my worries. It’s true that no one is forced to accept a bone-matched partner, but it’s that or a life spent alone. No one wants a mate who was fated for another. I slam a fist down on the table and my mother startles. Good. At least it’s an expression besides the calm mask of certainty she usually wears. All the tutors I’ve ever known have outlived both their hearing and their eyesight. Even when they’ve made mistakes, none of them have ever hurt their pupils with anything more than a sharp tongue or unrelenting high standards. It’s the safest vocation I can think of. “That’s an interesting choice,” my mother says. “And certainly something worth considering.” She slices off another piece of apple and offers it to me. It’s a poor substitute for a promise, but it’s the most she’s willing to give. ‘The Bone Charmer’ by Breeana Shields is set to hit shelves on May 21, 2019. You can preorder your copy now from Amazon, Barnes & Noble, or Indiebound. Also, don’t forget to add it to your Goodreads “to read” list!